Acres = Estimated area, (20.000 acres) twenty thousand acres. Estimated grazing capabilities, nine hundred cattle, or four thousand sheep. Bounded on the north by Goobaragandra Creek for eight miles; on the west by the Tumut River to where the Blowering Mountain comes into the river; on the south by Blowering Mountain, which separates my run from Whitty's; on the east by the Boogong Mountains. (Ref- The Sydney Morning Herald (NSW : 1842-1954) Monday 16 October 1848). Obtaining title to the land in 1839 Mr. Rose then sold to George and William Shelley, who had been at Bombowlee for 10 years. This seems to have been the first property sale. This 1280 acres is Block No. 1 on the County of Buccleugh land map; No. 2 being the block next to it taken up in the name of George Shelley’s wife Amelia. Mr. George Shelley had married Miss Amelia M. Waddy at Parramatta on September 1st 1835 and brought his bride to Bombowlee, Tumut, where he had been the first land holder. Mrs. Thomas McAlister of Darbalara (mentioned earlier) had the house in readiness when the bride and groom arrived - these were the first two white women in Tumut. 10 July 1839 Kelley W & G Tumut Plains Henry Bingham Esq County of Murray NRS 906 [X812]; Reel 2748-2749, Page 1 Superintendent: John Rogers. TUMUT.-The deaths occurred of well known and highly respected local identity, Mr. William Regent, for many years farmer, at Tumut Plains, aged 69, - (Ref- The Sydney Morning Herald (NSW : 1842 - 1954)(about) Previous issue Monday 8 September 1924). Mr Jonathan Regent, a farmer, resident at Tumut Plains, has been killed by lightning, as well as the horse upon which he was at the time riding.- (Ref- The Sydney Morning Herald (NSW : 1842 - 1954) Saturday 15 February 1862). A MAN AND HORSF STRUCK DEAD BY LIGHTNING - On Wednesday last Mr Jonathan Regest, a farmer, residing on Tumut Plains, left home in the morning to look after some cattle, intimating to his wife his intention of being back in the evening. Evening came, however, but not poor Regent, and be being a man of regular and punctual habits, his wife and family became alarmed at his absence. On the following morning the neighbours instituted a searoh, which terminated successfully about three o'clook on Friday afternoon, when Regent and his horse were both found dead about six miles from his residence, under a tree which had been struck by lightning. It is therefore conjeotured that he had taken shelter under this tree during the storm that prevailed on Wednesday afternoon, and had been struck by the lightning. Death, both to himself and his horse, must have been instantaneous there could have been no struggle, as one of Regent's feet still remained in the stirrup. His remains were brought home and interred in the Church of England cemetery - (Ref- Wynyard Times, February 4. - (Ref- The Maitland Mercury & Hunter River General Advertiser (NSW : 1843 - 1893)Tuesday 11 February 1862). Portion No.1 - Parish of Blowering - County of Buccleuch. In 1829 just 4 years after Hume & Hovell passed through the area just south of his run. James Hannibel ROSE was on the ").Tumut Plains Run"
In the same year 1829 mention is made of Mr John Stuckey's property being situated further down the Murrumbdgee River from the Warby Run. So that made a small hand full of permanent people living in the area. Including Mr George Shelley Name of run, "Bombowlee"
"EMPLOYEES" and or "SUB DIVISION" owners. Sometime in 1844 Mr Augustus LeFevre arrived at "Tumut Plains" to work on the property. In 1880 Mr George Johnson, 1st is listed as working on "Tumut Plains". Chinese In the Kiandra - Tumut Plains - Tumut - Blowering areas. 153. Shelly Wm., estate of, (per Susannah M Shelley.) Name of run, Bumbowlee. Estimated area, twenty-seven thousand acres. Estimated grazing capabilities, one thousand two hundred cattle, or nine thousand sheep. 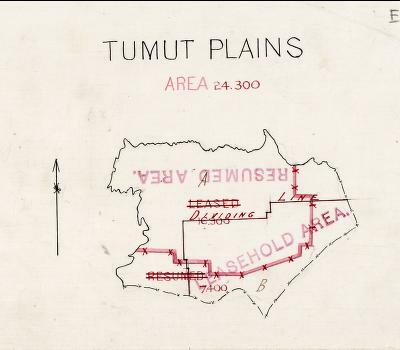 Bounded on the west by the Tumut River, commencing half a mile below Mundongaldgee hut, extending along the Tumut River to the lower end of Cockatoo; then by a tier of ranges running over to a creek called Kilmacat, crossing that creek one mile below Shelly's Kilmacat sheep station; on the north by the Pine Mountain and Wianga Range ; on the east by two miles of the Brangle Creek, commencing at the Black Swamps; then by a tier of ranges extending to a flat called the Spring Sheep station; on the south a line of hills, and ranges, which separate the run from Broughton's and Whitty's runs. 154. Shelley George Name of run, Tumut Plains. Estimated area, twenty thousand acres. Estimated grazing capabilities, nine hundred cattle, or four thousand sheep. Bounded on the north by Goubaragandra Creek for eight miles; on the west by the Tumut River to where the Blowering Mountain comes into the river; on the south by Blowering Mountain, which separates my run from Whitty's ; on the east by the Bongong Mountains. - (Ref- The Sydney Morning Herald (NSW : 1842 - 1954)(about) Previous issue Monday 16 October 1848). The Tumut Country. , . (FROM OUR REPORTER.) The Tumut country is known as one of the most fertile regions of New South Wales. Situated in a mountain district, it has usually an abundance of grass and water when the less favored districts of the lower country and plains are suffering from a lack of these necessaries. In dry seasons, like the present, multitudes of sheep and cattle are driven from the lower country, and from the plains, to pasture in the abundant verdure of Tumut, and to quench their thirst at her ever-flowing streams. The prolonged drought of the present season has, however, scorched the pastures of even this district, and left her hill sides brown and sere. The seerching heat and the rainless days of the past few weeks have brought about this state of affairs, as up to that time grass was fairly abundant. The scarcity of to-day can, however, bear no comparison with the unfortunate desolation of other parts of the colony. This description is only appropriate to the hill country around Tumut, as her plains and valleys are still covered with fair pastures ; and so fertile are their soils, and so abundantly watered, that it would be hard to conceive the drought whioh would render them otherwise. THE TUMUT PLAINS - are extensive areas pf rich vegetable mould, containing thousands of acres of land so fertile as to produce cereals, vegetables, and fruits in the richest profusion, and with water so near the surface as scarcely to require any irrigation. These plains were, nodoubt, at one time a lake, which has been gradually filled up by sedimentary deposits from the surrounding mountains, and eventually drained by the action of the streams flowing from the lake, cutting channels for themselves in the obstructions which impeded their progress to the sea. The extent of the plains is larger than appears at first sight, as they wind in and out among the hills, forming beautiful and far reaching valleys in many directions, all very fertile and well watered. On the plain water may be obtained anywhere by sinking distances of from 4ft to 10ft deep. The soil, which is usually of that depth, rests on a bed of boulder drift, the wash of former ages from the mountains, and contains gold in some quantity. The Tumut River and numerous small tributaries water this region. The plains and an extensive area of the hill country at one time formed the run of the late Mr. Shelley; and the property is still largely in the possession of the Shelley family; Mr. R. M. Shelley, of Tumut Plains, owning some portion of it, and his brothers-in-law, Messrs. Brown and Harris, owning the major part. The last two gentlemen have about 400 acres of their land rented to Chinamen for tobacco-growing purposes. About 500 acres of their portion of the plain are planted to maize. Mr. R. M. Shelley rents a considerable area of his property to Europeans at rentals of from £1 to £110s per acre. At present the plain is dotted with Chinese tobacco plantations, and their sheds for curing and drying the leaf. DAIRYING pursuits the country is well adapted. .But the business is not prosecuted to any great extent. Mr R. M. Shelley has a cheese factory near his residence, Tumut Plains; but the present dry season has somewhat interfered with the output. The cheeses made are of good quality, and find a ready sale at Young, Goulburn, and other places. TOBACCO. CULTURE - is now the great industry of the district; and, as this crop is practically in the hands.of the Chinese, the benefits accruing to the country from the development of this industry are not as great as if white labor was employed in the business. Why the Chinese are employed so extensively in this business, is. a question I an unable to answer. The Chinaman can certainly, pay more rent for an acre of land (and, make a living out of it than a white man. A Chinaman, as a genera, rule has no family to shelter, feed, clothe, and educate; no literary tastes to satisfy; no religion to support; no political or social clubs to patronise; and attends no race meetings, balls, or parties. He lives in a shed, works incessantly from sunrise to sunset, Sunday and Saturday; is clothed in the cheapest garments; and lives on the poorest food. Competition with such a one is beyond the power of a white man; and, therefore, the Mongolian pan afford to give more rent for his tobacco land than a white man, and as a matter of course, drives the white man out of the field. This is, however, only one view of the ease, and does not answer my question, because there are white men (of whom Mr. E. M. Shelley is one), who will not rent to Chinese at all, and will and do rent to white men at a cheaper rate than Chinamen can obtain land. There are others who reluctantly rent to Chinamen, and who would rent more cheaply to white men could they be obtained. And then there are thousands of acres of land in the hands of white men, which are in every way fitted for the production of any crop, but are simply used for pasture. Chinamen frequently pay as high a rent as £3 per acre for tobacco land at Tumut. Much of the land is let on the share system; and in that ease as high a price as £6 an acre is annually paid to the owners of the land as their share. THE PRODUCTS OF TUMUT, - Mr. Brown says that they cannot be excelled. The maize of the district tops the Sydney market. But maize must touch 4s per bushel before it will pay to send it to Sydney. A considerable supply of fresh fruits would be sent to the Sydney market from the district if the railway rates permitted this to be done. But under the present arrangements the railway freights are so high as to preclude the possibility of sending fruits by this means at a profit. As an illustration of this a resident of Tumut on a recent trip to Sydney brought a small lot of apples container about four dozen as a present to a friend, and on that small quantity had to pay 6s hr freight on arrival in Sydney. That this should be the case is simply ridiculous, and calls for immediate investigation on the part of the railway authorities. OBITUARY. - MR. R. M. SHELLEY. Mr. Rowland Mansfield Shelley, who died recently near Sydney, was the youngest son of the late Mr George Shelley, who was the first squatter In the Tumut district. He was born on July 15, 1847, at The Old Cottage, on the banks of the Goobraganbra River, Tumut Plains. Soon afterwards his parents moved to a new home on higher ground known for many years as The Plains, but now known as Camelot. Mr. Shelley was educated at Dr. Wood's school, Parramatta. St. Marks Collegiate School. Macquarie Fields, and The King's School, Parramatta. He entered the services of the Australian Joint Stock Bank, and held positions at Wagga Wagga and Deniliquin. He then went on the land, and later became the owner of The Plains, where he lived until 1907. He was one of the first aldermen of Tumut, and was Mayor for two years. He was returning officer for 18 years, Magistrate for 25 years, Licensing member on the Bench for 20 years, president of Agricultural Society and Farmers' and Settlers' Association, a member of the School Board, a Warden at All Saints' Church of England for 25 years, and secretary and treasurer for 20 years, and Past Master of Tumut Unity Lodge of Masons. He leaves a wife and one daughter and four sons. - (Ref- The Sydney Morning Herald (NSW : 1842 - 1954)(about) Previous issue Friday 13 January 1933 Page 10). Date Arrived : 13 November 1817 . Ship Arrived on : . The" Barque..Matilda "
Gail Bennett from Australia requires help with her Great, Great, Great Grandfather, David Crampton (Crompton). David Crampton (Crompton) served with Wellington's Regiments during the Napoleonic Wars. He as was wounded after three battles earning honours and a service medal for these deeds. As a volunteer he served with the famous 48th Regiment, arriving in Australia on The Barque " Matilda" became an Australian Redcoat Settler, after his discharge, as a private. (Muster Pays in the Mitchell Library in Sydney NSW) he was offered a land grant in the Snowy River Area of New South Wales in the locality of Tumut. He married Eliza Hayes in Sydney at the Church of England St Phillips Church in 1834 and had 2 sons David (1835) and William (1836). He died in 1876 in Tumut and is possibly in the Pioneer Graves in Tumut. He and his family were responsible for farming and producing many things in this part of the then wilderness. As an important part of the settlement of the New South Wales Snowy River Areas if feel that David Crampton should be listed a favourite son for Blackburn. From his death certificate Gail knows that David died 18th Sep 1876 aged 74 and his father’s name is given as David Crampton (mother’s name was not known). Can you help Gail locate David’s baptism?